Acorn Trout Lodge is a beautiful log cabin, located on Fightingtown creek, a nationally protected trout stream. Enjoy the luxurious accommodation and relax in the hot tub, get cozy in front of the outdoor fireplace or splash and fish in the stream. Located within ten minutes of a wide range of activities, including the historic town of Blue Ridge - which offers good restaurants and antiquing. Also take advantage of the breathtaking views while hiking or cycling in the lovely Cohutta wilderness or any of the many other wilderness areas near us. Experience the exhilaration of white water rafting the Ocoee river or horse back riding in the mountains. NOW WITH WIRELESS BROADBAND INTERNET ACCESS. This place is amazing! very, very beautiful. We had such a wonderful time and really hate to go. - Matt and Meril Dailey. Aiming to be the best in customer service. Great for weekend getaways from Atlanta and Florida. Property banks on to Fightingtown Creek - great for trout fishing, swimming, tubing or kayaking. (2) 39 inch flat screen television in the living area and a 32 inch flat screen the master bedroom. Separate Upstairs balcony with Bistro table and chairs. Large outdoor gas fireplace on deck. Restful and quiet. The neighbors were far enough away through the woods that they weren't noticed. The cabin itself was very comfortable, no ridiculous decorations that the dogs would knock over or eat, really just perfect in that respect. The large covered deck overlooking the river was a prime spot for relaxing. I'm not a big fan of hot tubs, but due to the privacy and the cleanliness of the whole place, this one was a winner. After dinner hikes down the country dirt road, the moonlight coming through the bedroom window, the sunrise through the trees, it was a special experience. We hiked during day and had a wonderful place to come back to at the end of several long days. I also loved the really classic books they had on hand, both adult and kids, brought back many great memories. We very much loved our stay at acorn trout lodge. It was like a home away from home. 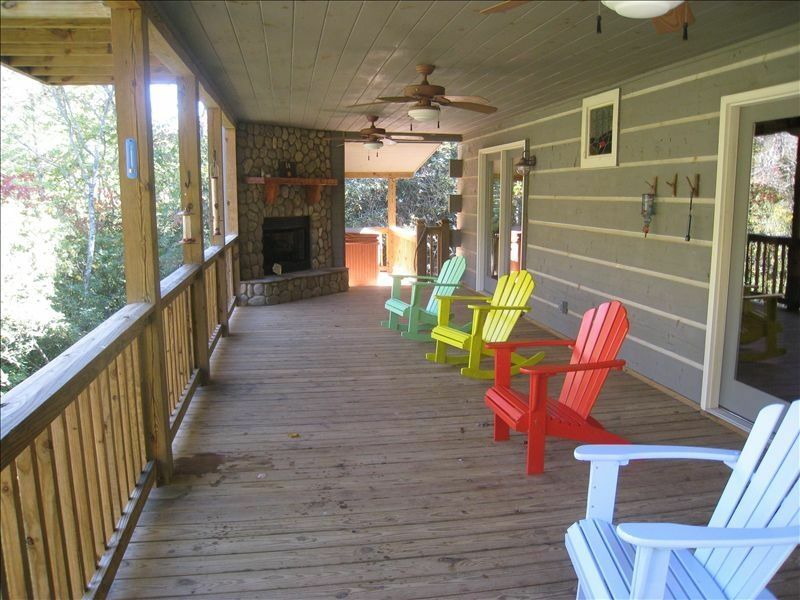 The large back porch, hot tub and porch fireplace were awesome. We spent most of our time there. The living room furniture was a little outdated but comfortable. The most perfect getaway cabin!! We LOVED Acorn Trout Lodge!! It very comfortably housed three teen boys and three adults. The seclusion was perfect -- even though there were neighbors around us, the natural buffers made us feel as though we were the only ones there. The boys enjoyed tubing down Fightingtown Creek, the hot tub, and their bed lofts. We'll definitely come back! Just a suggestion for new visitors: bring an electric skillet as the pans aren't the greatest, but everything else was perfect! One complaint only—-most uncomfortable sofa in history of sofas. Nicest cabin we ever stayed in. The Creek was lovely and we really enjoyed sitting out on porch listening to the Creek. We absolutely loved this cabin. It was exactly what we were wanting for our vacation. There was 7 of us, 5 adults and 2 kids and we had plenty of room. The kids loved the beds in the walls and the bedrooms turned out to be a nice surprise with lots of room. The cabin was very clean and well stocked with towels and linens, also the kitchen had everything we needed to cook most of our meals. We found it to be very pet friendly with the crate and bowels, although we brought our own bowls and didn't use the crate, it was a nice addition. Lots of space both inside the cabin for everyone as well as the backyard. We managed to get down to the creek behind and fish and swim around in the water. The back porch was a definite favorite as well as the hot tub. We had one day where it rained most of the day, but we could still hang out on the porch and not get wet. Very peaceful and tranquil, could listen to the creek all day. Only one thing I would suggest is maybe a hammock either on the porch or down in the yard. We loved this cabin and will definitely book again. It was a very nice stay. The cabin had everything we could ask for. Although the cabin is kind of located off the beaten path and sometimes you tend to wonder if you will ever find your way back when you leave, you always do. We enjoyed all the facilities at the cabin. The cabin was very comfortable. It would have been nice if there was a little more light in the kitchen. And probably for old folks like us it would be better to know that you have a steep bank actually getting down to the creek. But we managed. And we actually caught a few nice trout. I would definitely like to stay there again.